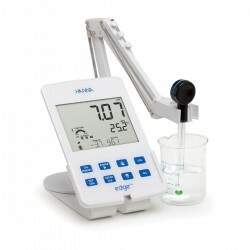 The HI-5221 is an advanced research grade benchtop pH/mV meter that is completely customizable with a large color LCD, capacitive touch keys, and USB port for computer connectivity. The HI5521 is rich in features including 5 point calibration, selectable resolution, data logging, alarm limits, comprehensive GLP, and many more while retaining simplicity in use with both dedicated key for routine operation and virtual keys that guide the user through setup options. 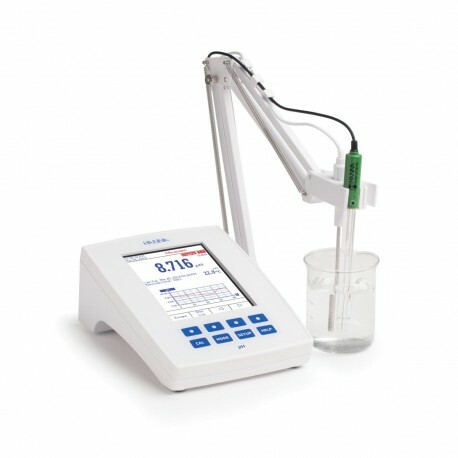 The HI5521 ensures confidence in measurements with the exclusive Hanna Instruments CAL Check™ feature that alerts the user to potential problems during calibration including if the buffer is contaminated or the probe needs to be cleaned. 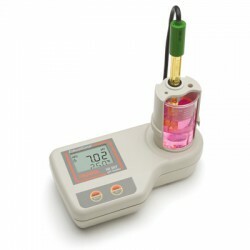 The HI 5221 is an advanced research grade benchtop pH/mV meter that is completely customizable with a large color LCD, capacitive touch keys, and USB port for computer connectivity. 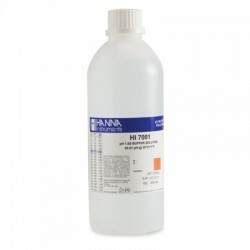 The HI5221 features a universal BNC connection for use with the expansive line of pH and ORP electrodes that Hanna Instruments offers. 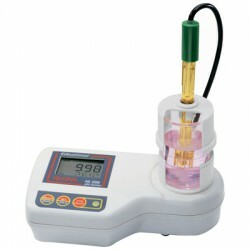 The meter is supplied with the HI1131B glass body, double junction, combination pH electrode that operates over a wide temperature range from 0 to 100 °C. All readings are automatically compensated for temperature variations with the separate HI7662-T temperature probe that is included. 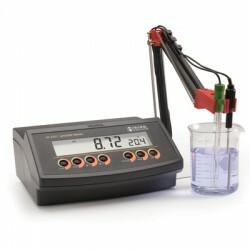 The HI5221 can be calibrated up to five points with a choice of eight pre-programmed buffers or five custom buffers. The HI5221 features Hanna’s exclusive CAL Check™ to alert the user of potential problems during the pH calibration process. Indicators displayed during calibration include “Electrode Dirty/Broken” and “Buffer Contaminated.” The overall probe condition based on the offset and slope characteristic of the electrode is displayed as a percentage after calibration is complete. The calibration data including date, time, buffers used, offset and slope can be accessed at any time along with the current measurement by selecting the Good Laboratory Practice (GLP) display option. 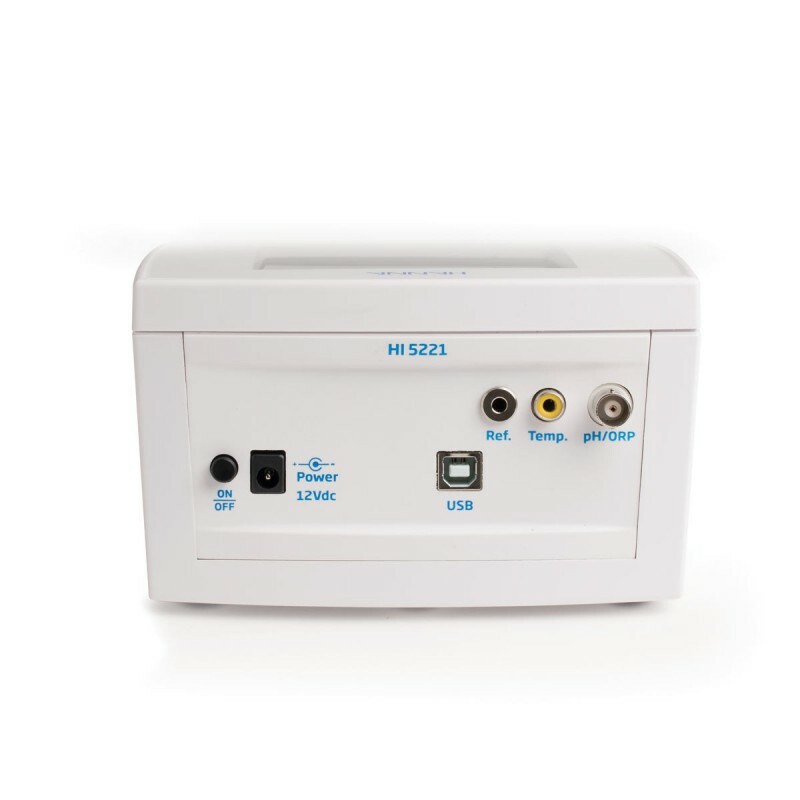 Highly Customizable User Interface – The user interface of the HI5221 allows the user to show measurements in various modes: basic measurement with or without GLP information, real-time graphing, and logging data. Calibration stability criteria can be adjusted from fast, moderate, and accurate. Programmable alarm limits can be set to inside or outside allowable limits. Color Graphic LCD – The HI5221 features a color graphic LCD with on-screen help, graphic, and custom color configurations. 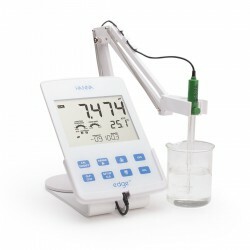 The display allows for real-time graphing and the use of virtual keys provide for an intuitive user interface. Capacitive Touch – The HI5221 features sensitive capacitive touch buttons for accurate keystrokes when navigating menus and screens. There are four dedicated keys that are used for routine operations including calibration and switching measurement modes and four virtual keys that change based upon use. 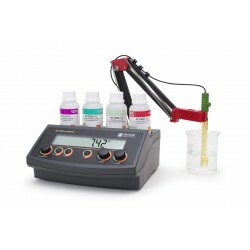 The capacitive touch technology ensures the buttons never get clogged with sample residue. Choice of Calibration – Automatic buffer recognition, semiautomatic, and direct manual entry pH calibration options are available for calibrating up to five points, from a selection of eight standard buffers and up to five custom buffers. GLP Data – HI5221 includes a GLP Feature thatallows users to view calibration data and calibration expiration information at the touch of a key. Calibration data include date, time, buffers /standards used for calibration and slope characteristics. 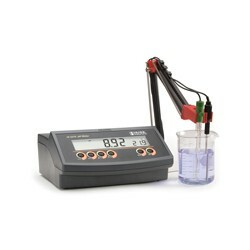 The offset is also displayed for pH electrodes. CAL Check™ – CAL Check™alerts users to potential problems during the calibration of the pH electrode. Indicators include “Electrode Dirty/Broken,” “Buffer Contaminated,” electrode response timeand the overall probe condition as a percentage that is based on the offset and slope characteristics. Data Logging – Three selectable logging modes are available on the HI5221: automatic, manual, and AutoHold logging. Automatic and manual logs up to 100 lots with 50,000 records max/lot, with up to 100,000 total data points. Automatic logging features the option to save data according to sampling period and interval. HI 5221 is supplied with HI1131B pH electrode, HI7662-T temperature probe, HI76404W electrode holder, HI70004 pH 4.01 buffer solution sachet, HI70007 pH 7.01 buffer solution sachet, HI700601 electrode cleaning solution sachet (2), HI7082 3.5M KCl electrolyte solution (30 mL), 12 VDC adapter and instructions.